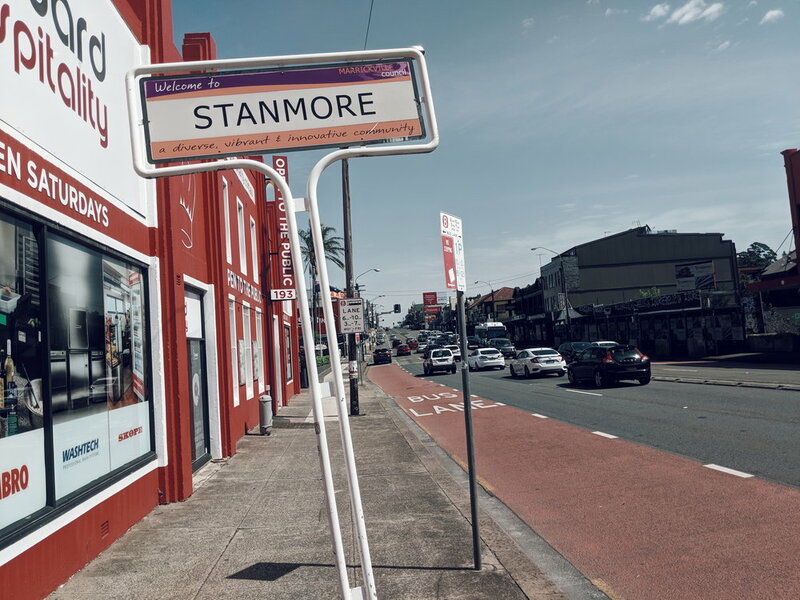 I went walking around Stanmore. It's a peaceful suburb in Sydney's inner west, leafy streets of Victorian worker's cottages and flaking pastel terraces shaded by Frangipanis and draped with pink flowering crepe myrtles. I came towards the grey concrete roar of Parramatta road and turned on my heel, back into the suburb, and looked for a place to sit down. I wanted to write something, and I wanted to just be outside for a while. I had a few things to do, but on this sunny Sunday morning, my last day in Sydney, I felt like just being there in what nature I could find. My options, for a place to sit? Sit directly on the footpath, on the ground with the rotten flowers and mouldy blackening leaves, my back against someone's front fence. Sit on somebody else's front step. Sit on the gutter, between two cars. I walked for a few blocks, and these were the options. To be in the walking space, or in the car space, or to be dangerously close to intruding on a stranger's personal space. I could have walked ten to fifteen minutes, whereupon I'd have come to a very noisy Enmore Road where i could sit in a cafe or go into a shop. The only entities that are sanctioned, in this pretty residential suburb, are the walker, the driver, the parker, and the resident. The only activities that are sanctioned by the environment are walking, driving, parking, and being in your own private space. To sit in a public space, almost exclusively means to engage in consumerism - to make a purchase and sit in a cafe. Most public seating is in bus stops. The environment simply doesn't allow for spending time in a public space. I ended up sitting in an alleyway in between two houses, on a concrete gutter too narrow to be a footpath, between two brick walls leading to a grafitti covered back lane. The problem with sitting on the footpath or on the gutter isn't anything to do with the physicality of the space. I'm very happy sitting on the ground, happy to sit on concrete. I'm lucky enough to be physically able to sit pretty much wherever I want. The problem was that I instinctively felt that it would be awkward to sit in any of the options available. On the footpath is both in the way of walkers and joggers, and blatantly breaking social convention. I don't know if it would have happened, but my expectation would have been that someone might even have asked me if I was okay, sitting there on the ground. It was also kind of dirty, the humid subtropical mould and leaf litter of Sydney's inner west. The built environment encourages some behaviours, and discourages others. It's almost impossible to stop for a minute and simply BE a part of this environment, unless you're a resident and you both have a front porch, and choose to sit on it. The environment, welcoming as it is to a walker, doesn't welcome a sitter. Keep moving. Don't linger. Don't observe. This is one of the most pervasive and invisible parts of the Sydney mindset that has always bothered me, without me realising what exactly it was. It feels like here, the most polite thing to do is to let everyone else be. Almost like noble silence. Allow others to maintain their sense of solitude. Don't make eye contact with strangers on the street. For the most part, don't acknowledge. Don't bother your neighbours. Let them be alone. I guess it's a matter of individualist culture. Perhaps the assumption is - everyone else wants to be left alone. Maybe it's got to do with the size of the city: if you start acknowledging every person you see on the street, you'll be overwhelmed. There's no point looking up and making eye contact with every new person who walks into the pub - you could stay for weeks and not have someone you know walk in. It strikes me when I go to orange that when you walk into the pub, everyone looks up for a split second. It makes sense: decent chance in a town of 40,000 that you might know the person who walks in. But that individualism is codified into our built environment. When there literally are no spaces to be in public for periods of time longer than the walk to the bus stop, of course we don't meet the other humans around us. Of course people move to a new city and have to go to Meetup groups and join sports teams to make friends. Tell me, literally, how do you meet your neighbour if you don't have a front porch and they don't either? Our environments keep us apart. Even if the individuals want to be more communal in attitude, the built environment precludes it. And there's nearly nobody outside in this suburb. I saw one man on his front porch, cleaning a whipper snipper. I saw a shirtless guy jogging, and a teenager walking around, and a few people walking dogs. And a lot of cars. It almost feels like it's wrong to just sit outside without DOING something. There's some kind of expectation of productivity. Even if you really are just sitting on the front porch watching the world, you should at least have a book or a cup of tea next to you. And sitting on the street doing nothing? Genuinely, it feels like I'm being creepy. Just sitting and watching people go by? The only people in Sydney I can think of who I've seen doing this are the indigenous people I see sitting around in Redfern. And people, by their reactions of studious non-eye-contact, are a bit scared of them. Even the homeless people in the city usually look down or even prostrate themselves in child's pose, face to the ground. This makes sense to me: people feel more intimidated giving money to someone who's watching them than to put money anonymously into a cup in front of someone who they trust won't acknowledge them. I think it's the danger - you don't know how that person will react. There's no codified social rules about interacting with someone on the street asking for money. Taking the direct human interaction out of the picture makes it safer. Just like drivers, locked in their own cars, feel safe to shout at someone for cutting them off. There's no danger of real human contact. There is inherent danger in community. I found noble silence to be one of the most freeing experiences of my life. Knowing with total certainty that nobody would speak to me gave me a sense of security to be myself in a way I never felt before. 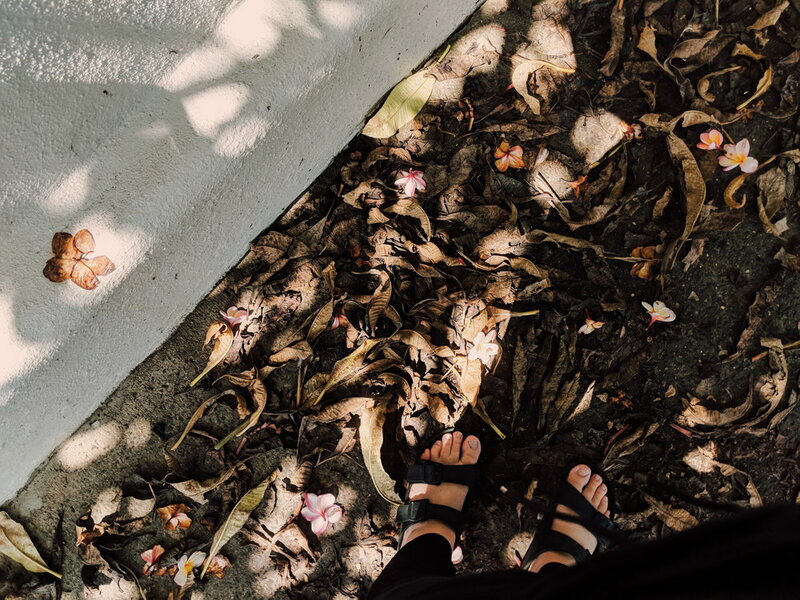 I crouched and watched ants for hours, kicked dirt, dug holes, wore whatever I wanted. Somehow, knowing nobody could question me, verbally attack me, antagonise me, or even disturb my solitude, made me feel completely secure. I don't live my life feeling like strangers will verbally attack me or antagonise me. But I guess the knowledge is there that it's a possibility. Knowing that at any moment someone could come up and start asking you a question or talking to you, somehow feels like a mild threat. The awareness is there that you ought to behave in a way that doesn't step outside the norm. Doesn't invite discomfort in others. Maybe the desire for privacy in our own spaces is simply a desire for safety - safety from potential questions or verbal comments from others. Why is it that that feels like a threat? I want a suburb with big front porches and seats in the street. Actually, I want big trees with grassy spots underneath to lounge under. I want tuk tuk drivers napping in hammocks in their vehicles parked on street corners. I want people smoking and chatting on their front step. I want street corners with chess sets and old men. I want town squares with old ladies clinking coffee in the shade, where it's just as inviting to sit on a public bench as it is to sit in the cafe next to it. I know these places exist. I just don't know how Sydney might start to look more like them.